Signs of cancer may also not be clear or obvious and GPs see, on average, only around eight new cases a year. A full time GP will have between 6,000-8,000 appointments every year. And they will only have around 10 minutes per appointment to pick out warning signs that could be cancer, but equally may be a symptom of a less serious condition. Sarcoma UK's On The Ball campaign is still going to help with diagnosis. 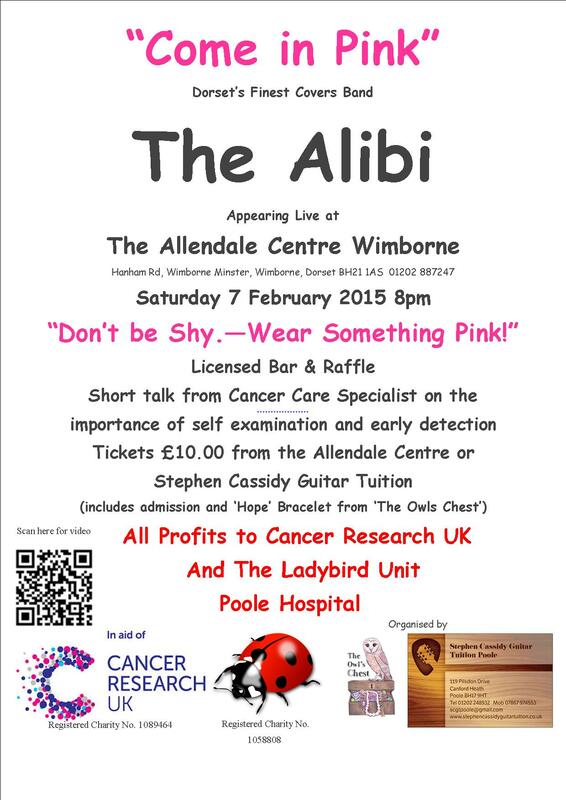 There's a Charity Event on 7th February 2015 in the Allendale Centre in Wimborne to raise funds for Cancer Research UK and Poole Hospital Ladybird (Breast Care) Unit. 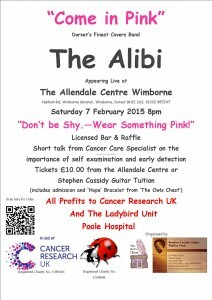 It features a local band 'The Alibi' and a Representative coming from Cancer Research UK to give a short talk during the Band's break on the importance of self examination and early detection.